"Viviana" and "Jonathan" drove from their home in a small mountain community to Bakersfield�s abortion chamber, intending to abort their second baby. 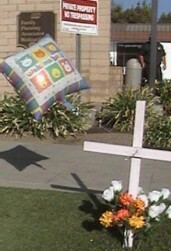 Crosses, flowers and balloons were positioned on each side of the FPA driveway. When Viviana was pregnant with their 5 month old baby, she had experienced serious complications which almost caused her to die, so when a doctor from her town found out that she was pregnant again, he recommended abortion and sent them to FPA. As the couple went in to the abortion business on Monday, Terri stood on the sidewalk offering them literature. They accepted the literature but went up the stairs to the abortion mill�s waiting room. As the abortion staff prepared to abort Viviana's baby, she was asked "have you eaten anything today?" Viviana confessed that she had eaten breakfast. "Then you'll need to come back tomorrow for the abortion," the FPA employee explained, "but this time don't eat anything after midnight. And don't miss your appointment, because if you wait until next week we will need to do a two day procedure" (which is more expensive and dangerous). That night, at their home in the mountains, Viviana and Jonathan took the time to read the literature Terri had given them, including the FPAvictims.com pamphlet which tells the stories of women who have died at the hands of "FPA" abortionists. After reading the pamphlets, Jonathan didn't want Viviana to abort their baby, but he told himself "she is the one who is pregnant, not me," so in spite of his fears he brought her back to FPA on Tuesday. Back inside the FPA abortion building on Tuesday, Viviana was still struggling with the decision, so she came out to talk to Jonathan. Terri thought she had already aborted the baby, so she began to offer her post-abortion help. Viviana remained silent, looking down to avoid making eye contact, but Jonathan to tell Terri that they were afraid that Viviana would die if she continued the pregnancy. When Jonathan told Terri that he and Viviana are Christians, Terri explained "Psalm 139 in the Bible says that God created us in our mothers� wombs, but it also says that He numbered our days before any of them came to be. God isn't going to let her go until He�s ready. It would be better to die doing what God wants than to die doing what the devil wants. Are you married?" "No," Jonathan confessed, "she wants to have a big wedding but we can�t afford it." "Well, the days for the white dress may be over, but it would be better to put your $395 toward your wedding than to spend it on killing your baby. You don't really want to have to remember that your baby was killed at your wedding. "The choices we make can lead us to bad consequences," Terri continued. "You don't want abortion, because it's not the baby's fault. You may still need the baby to be taken early, but you don't have to rip it apart." Terri encouraged the couple to get a free ultrasound at the Bakersfield Pregnancy Center first, and then to take a week to think through their decision. "We don't have a week," Jonathan said, explaining that they didn't want to go through a two- day abortion. Just then, Jennifer, the mother of a child who was saved from abortion, had come to the LifeHouse to get diapers for her baby. As Jennifer walked up, Terri was telling Viviana "every time you look at your little girl you�re going to think of the baby you aborted." Then Terri turned to Jennifer and said "talk to them." "What she's saying is true," Jennifer began, "I think about the baby I aborted a lot." Jennifer turned her face away, embarrassed by the tears. "I hate you guys," Viviana said, breaking her silence as Jonathan laughed in relief, knowing that she was beginning to realize that they would not be able to live with themselves if she went through with the abortion. "I don't want to be pushy," Terri said, "but the Bakersfield Pregnancy Center closes for lunch in 20 minutes. Do you want an ultrasound?" The Bakersfield Pregnancy Center said they couldn't promise to squeeze Viviana in, but they would try. Within a few minutes, Viviana and Jonathan were viewing their living child--at the very moment when the child was scheduled to be aborted. Viviana and Jonathan returned home, trusting God to protect the health of both mother and baby. Terri called a volunteer in the couple�s mountain community to arrange for help through the Elizabeth League. For several years, LifeSavers Ministries has been hoping to establish a "Traveling Life Center" in an RV which would travel to the area where Viviana and Jonathan live (in addition to other communities) to reach pregnant women and their children.